My trip to Hungary this summer was different from those before. It was my first visit in 3 years, my first time back after the death of my maternal grandparents with whom I stayed every summer since we moved from Budapest in ’99. 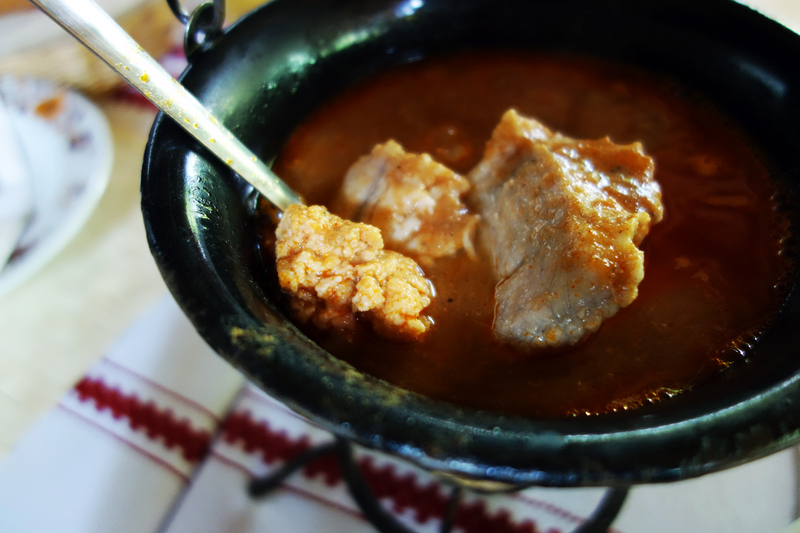 It was my first time going back as a world traveler, a food obsesionada, an aunt, an adult. It was also the first time I felt like more of a tourist and guest than someone truly from there. And while the gradual disintegration of some familiar ties and feelings of not belonging are sometimes disheartening, these things also free me up in a new way. This summer I looked past the ritualistic feasts at my grandparents’ house in Budapest and for the first time yearned to see and taste more of this country that I still consider my own. Maybe it was meeting so many Hungarian culture-bearers from all over the country during the Smithsonian Folklife Festival that initially sparked the interest. Or maybe it’s the fact that as I get older I lose interest in cities altogether. Or maybe I just kind of lost interest in Budapest somewhere along the way. For whatever reason, I found myself wanting to get out as much as possible during the short week I spent in Hungary. I also decided to take at least one excursion out of Budapest every time I’m back there. This time around, my brother and his wife took me to the Danube Bend, which was a region I didn’t know existed. It’s only a short drive from the capital. “Bend” refers to the section between Esztergom and Szentendre where the river turns suddenly south towards Budapest. There’s a rather large island that bends along with the river called Szentendre Island, and on the northwestern tip of this island lies the Kisoroszi Dunapart, one of the most beautiful beaches I’ve been to in Hungary and one of the chillest places I think I’ve ever been in general. 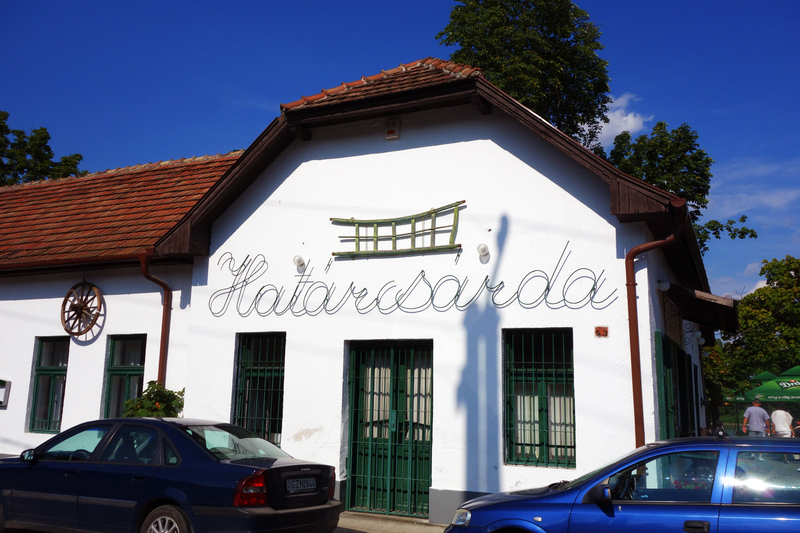 Conveniently located just a few steps from where the ferry that crosses from Szentendre to the island is Határcsárda restaurant, whose name translates literally to “the inn at the border” (in this case the border between Leányfalu and Szentendre). 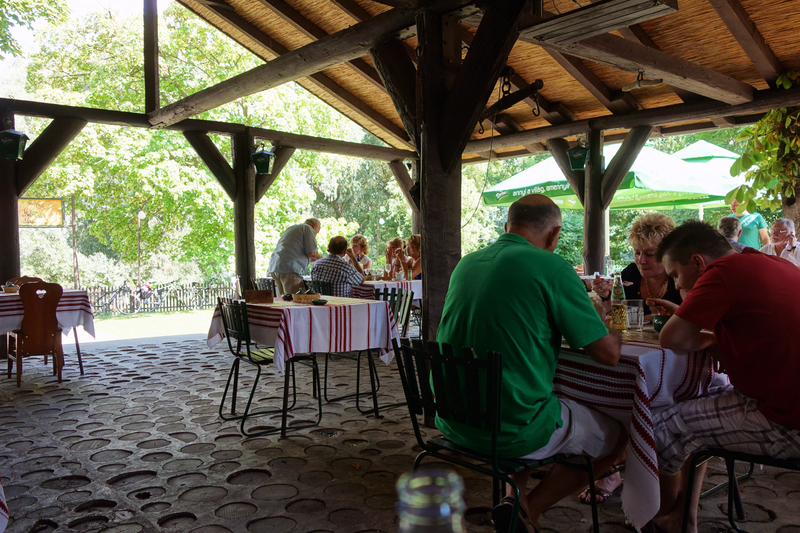 It’s quite the scenic spot, right on the banks of the Danube from which a fresh breeze blows straight through the outdoor patio on a sizzling hot summer day. Old school chic and tranquil. Prominently displayed little red lard pails rust away against whitewashed walls. Red and white striped tablecloths cover each table. I don’t think the menu rotates very often; they just kind of serve all the classics all the time. Dishes are simple but prepared well and served by a polite and knowledgable staff who can explain the preparation of each when asked. The view and vibe alone are worth stopping for before crossing over to the island. The halászlé (fisherman’s soup) here is the real deal. And I’m glad it is, since it was my brother who originally talked me out of going to Szeged, which is the city most known for it. “You’ll find the same quality at Náncsi Néni in Budapest, or when we go to the Danube Bend this Sunday,” he had said. And although I, lamentably, never made it to Náncsi Néni my brother did come through after all by bringing me to Határcsárda. We asked for the catfish with the innards included and got a miniature cauldron that bubbled peacefully over a little shelf of coals. It was seasoned perfectly, slightly spicy and packed with the flavors of paprika and fish juice, the freshwater brine of the muddy little creature adding character. The chunks of fish themselves were hearty and wonderful, with just the right amount of slimy skin left on (not a lot). The egg-sack was thrown in too and it had a great texture to it, like a grainy reef of coral or a mess of fine beads. They preserved within them the light mineral taste of the river soil but were otherwise very clean in flavor, as were their meatier counterparts. This was another dish I had not tried since the Folk Life Festival. It was about damn time for a good one. 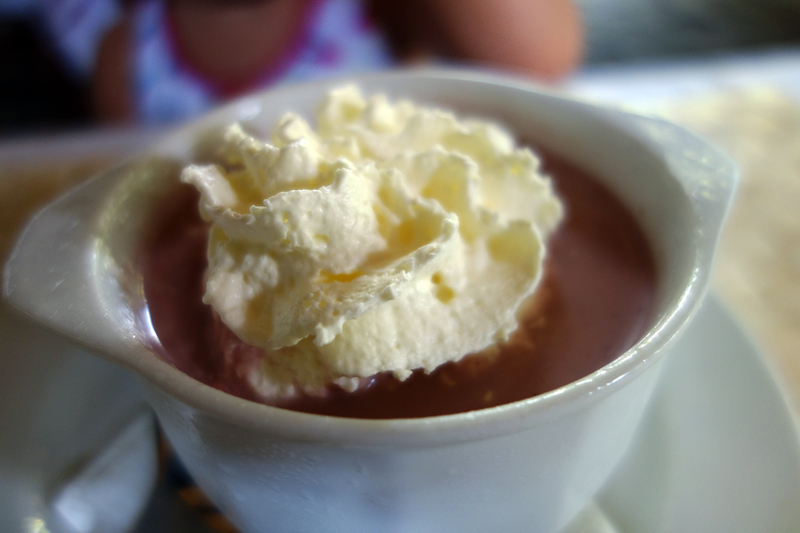 My brother got the Hideg Gyümölcsleves, or “cold fruit soup,” topped with a dollop of whipped cream. 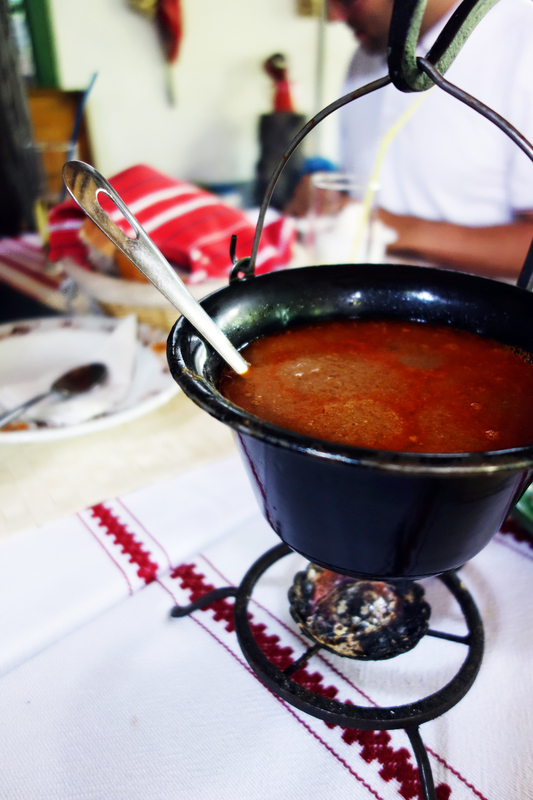 These soups are not uncommon in Hungary, at least during the summertime. 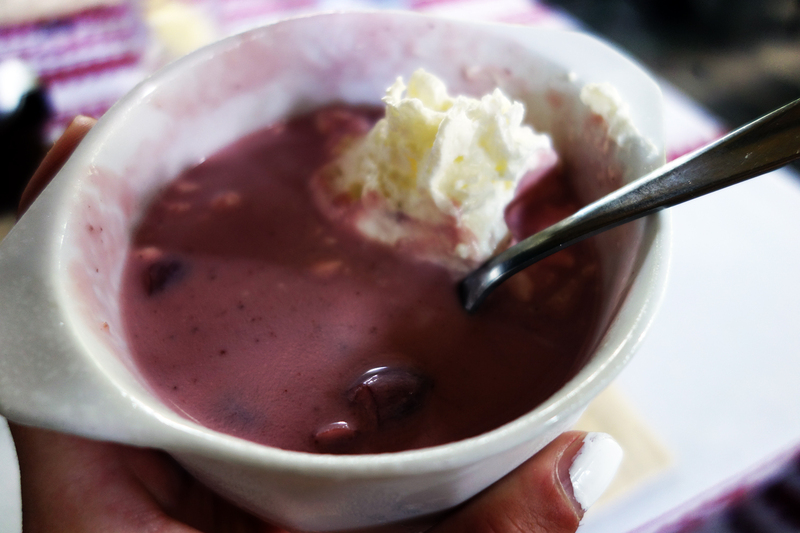 The restaurant’s version was the common recipe – sour cherries stewed with sugar and thickened with a roux of sour cream and flour. Cloves and a cinnamon stick or two are also thrown in to give the soup an autumnal flavor that feels strangely comforting in the summer. But these flavors don’t overpower the sweetness of the sugar-enhanced sour cherry, which is the protagonist of the thing. The cherries were also not overcooked (this can happen), but nice and plump with the skin still tight and the interior fleshy. My sister-in-law got to Vasi pecsenye, which is a pork cutlet breaded with paprika and flour, then fried til golden brown. 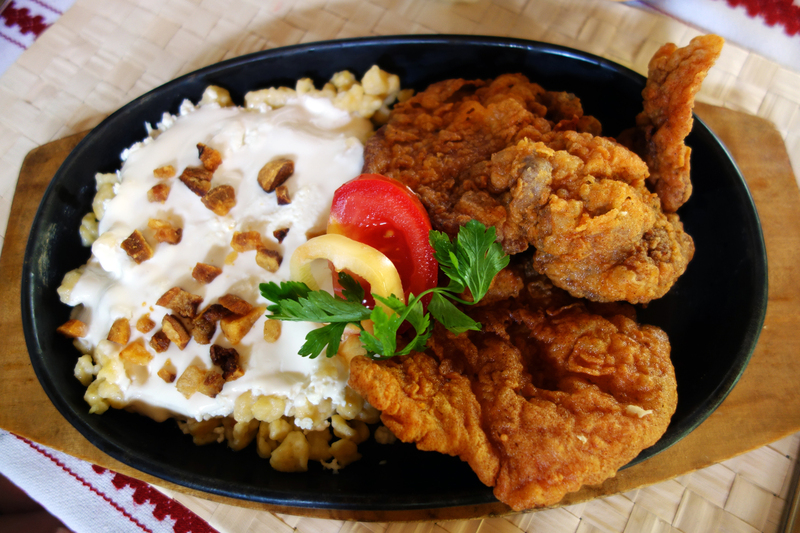 It’s served with egg noodles turned in quark cheese and topped with sour cream. This is a good dish if you’re hungry. The fluffy fried coat is crispy and heavy, though not outweighing the pork inside. The meat itself is very tender, as it is soaked in milk and garlic the day before preparation and then fried at the right temperature for the right amount of time. The flavors of the meat itself are refreshingly simple. The hint of paprika in the coat lingers, but most of the umph is added by the tangy quark and the smoky, salty bits of pörc (fried fatty bacon) sprinkled over the top. My brother got the borzaska, prepared “a la Szentendre.” This was perhaps my favorite dish, one I haven’t had in a very long time. It’s basically a pork cutlet pounded thin and rolled in a batter of egg yolk, garlic and grated potato. 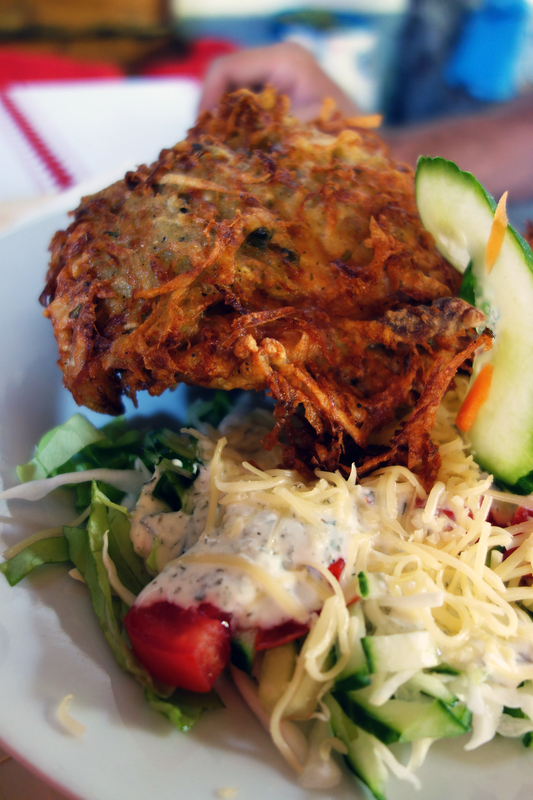 It’s fried to a luscious golden brown and served with a salad of lettuce, tomato and cucumbers. I think in this case “a la Szentendre” signifies the addition of dill to the batter to wake up the flavors a tad. There was also some dill in the seasoning that came on the salad, maybe even a bit too much. The coat is crunchy and flavorful, with the pork peeking out here and there. 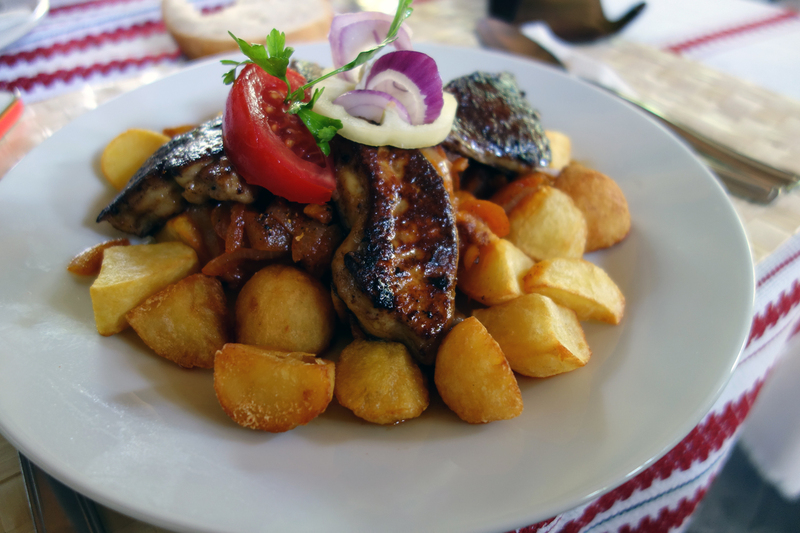 Again, not a very light dish at all but if you’re hungry and in the mood for some downhome Hungarian, this is the one for you. 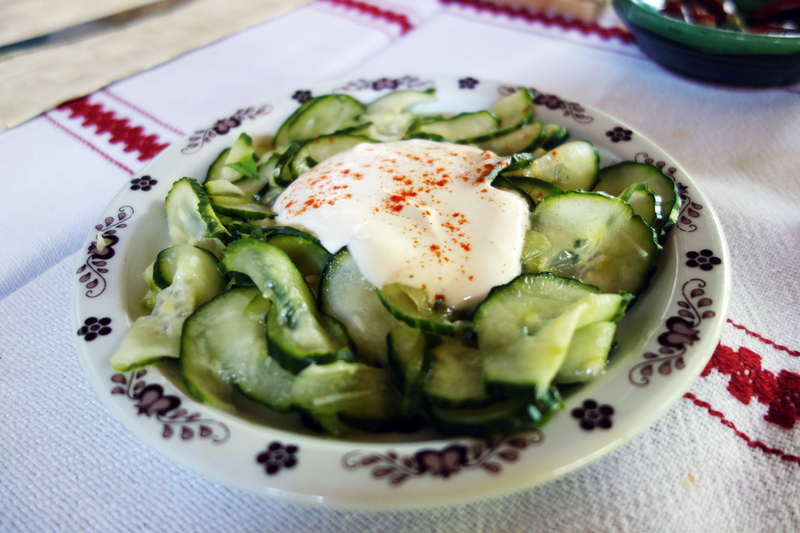 And then the salad of cucumbers lightly pickled in vinegar and sugar ubiquitous to Hungary, almost necessary when consumed with any of our traditional stews and breaded meats. The delicate brine adds a freshness to round out the smoky paprika, while the acidity cuts the lard with which these entrees are almost always prepared. Here the slices were just the right thickness; thick enough to maintain a crunch but without too much tannic skin to make it bitter. As is customary, the salad is topped with a dollop of sour cream to mix in as much or as little of as desired, along with a sprinkling of paprika for extra flavor. Hungary is the second largest producer of foie gras in the world, after France. 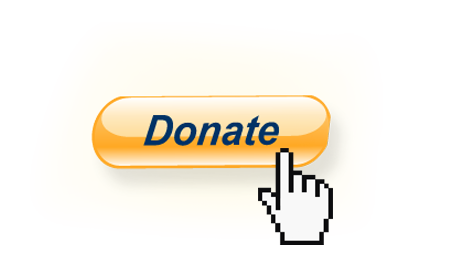 The country exports around 2,000 tons of the fatty liver per year. Most of it exported raw, then seasoned, processes and prepared in France to be sold as a French product. But a lot of it we keep for ourselves. 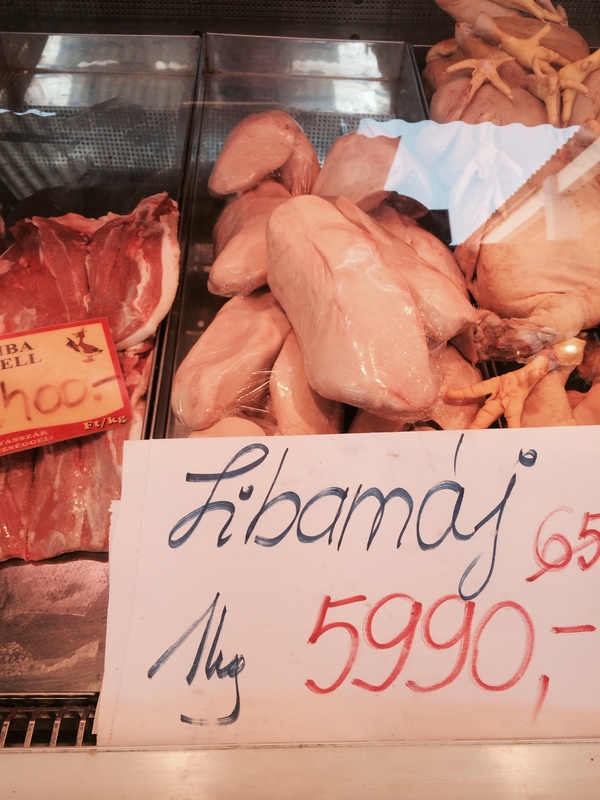 They’re all over the markets and cost around 6,000 forints per kilo, so about $10 USD per piece. Home cooks perhaps don’t use them quite as often as restaurants do. 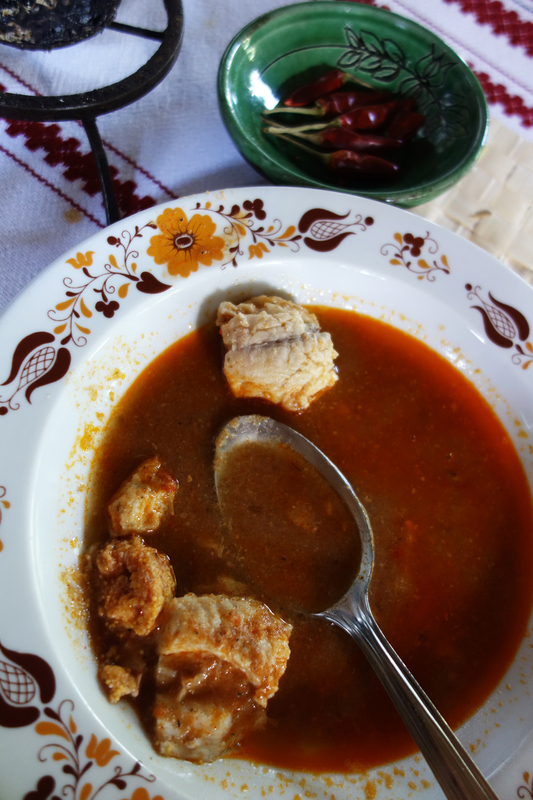 But pretty much every traditional Hungarian restaurant has them on the menu, prepared in at least 2 ways. The livers are usually either smoked or shallow-fried and there’s always a little something sweet paired with them. Sometimes that’s a sip of Tokaji, other times it’s some kind of grilled fruit served alongside. 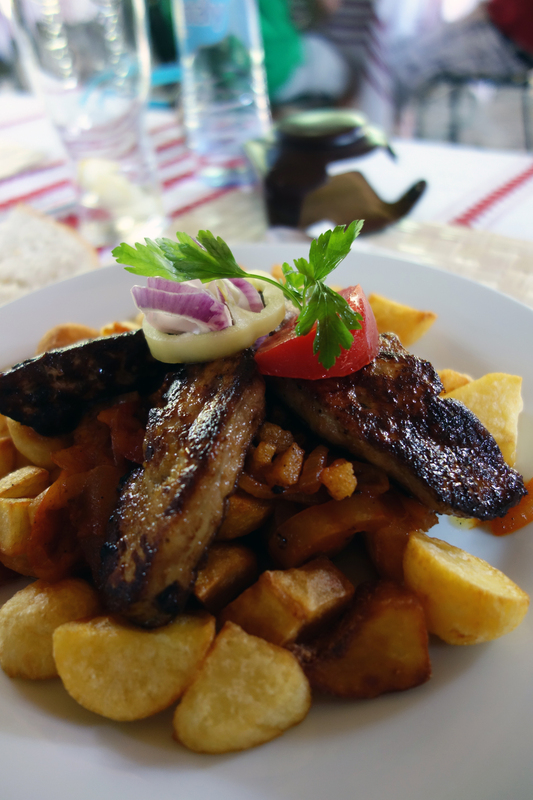 At Határcsárda the livers are fried in goose fat and heaped atop a mound of fried potatoes into a cozy bed of caramelized onions and smoky bacon. So in this case the source of sweetness is onion. The livers are luscious. They’re plump with the tight skin snapping when bitter into, like the casing of a good sausage. Inside it’s smooth and buttery soft. The feint mineral taste is balanced by smoke and the wonderfully rich flavor of the goose fat in which it’s fried. The Danube Bend is a great getaway, one I’m happy to know exists. Határcsárda fits perfectly into the story. August 10, 2014 in HUNGARY.